Second-bottom Crystal Palace were beaten for a sixth time in eight Premier League matches under Sam Allardyce as Joe Allen's second-half strike condemned them to a 1-0 defeat at Stoke. Palace were in considerable need of a boost a week on from the humiliating 4-0 home loss to basement boys Sunderland. But they found themselves on the end of another defeat after Allen fired into the bottom corner in the 67th minute following good work from Ramadan Sobhi. In a game that was pretty low on entertainment, Stoke had gone close to scoring just before the break when the impressive Bruno Martins Indi's header was cleared off the line by Andros Townsend. Allardyce's men, who rarely threatened, remain two points adrift of 17th-placed Swansea and 16th-placed Leicester, whose game in hand over Palace comes when they play each other at the Liberty Stadium on Sunday. Stoke, meanwhile, are up two places to ninth. Palace goalkeeper Wayne Hennessey, beaten four times before half-time on his last outing, produced a decent save in the ninth minute as he got down to block a strike from the edge of the box by Marko Arnautovic. The visitors then registered their first goalscoring attempt eight minutes later when Townsend delivered a cross and James McArthur headed wide. A shot at the Stoke goal from Patrick van Aanholt followed as Lee Grant dealt with comfortably, but it was the hosts who were applying more pressure, with Peter Crouch and Allen sending headers off-target and Arnautovic seeing another low effort saved by Hennessey. 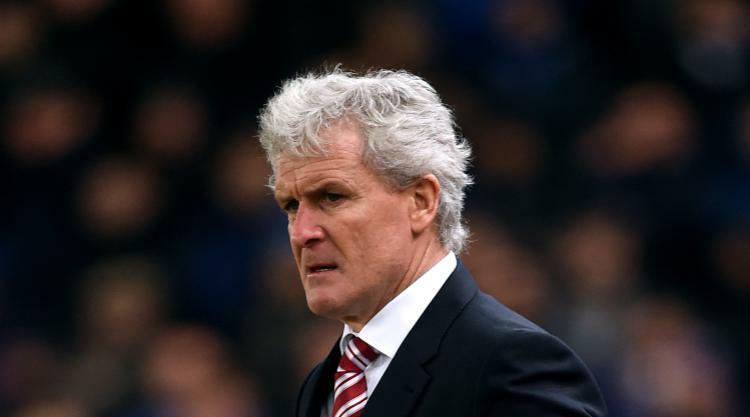 Mark Hughes' men then almost had the lead in the last few moments of the half as Martins Indi nodded a corner goalwards, Townsend getting there to make the last-ditch clearance. Nine minutes into the second half, the ball squirmed through to Palace frontman Christian Benteke in front of goal via a Jason Puncheon shot, but the Belgian was unable to react quickly enough and the danger passed. The game then went into something of a lull, before the deadlock was broken when Arnautovic's long ball forward was held up well by Sobhi, who then provided the tee-up from which Allen drilled into the corner. Palace struggled to muster much in their search for an equaliser, with a shot from James Tomkins and late free-kick from Townsend both being blazed into the stand. At the other end, Stoke substitute Ibrahim Afellay was almost played in by an attempted one-two with Arnautovic but was beaten to the return pass by the out-rushing Hennessey.